Jeb Bush "9/11 rubble" video: Says brother kept America safe. 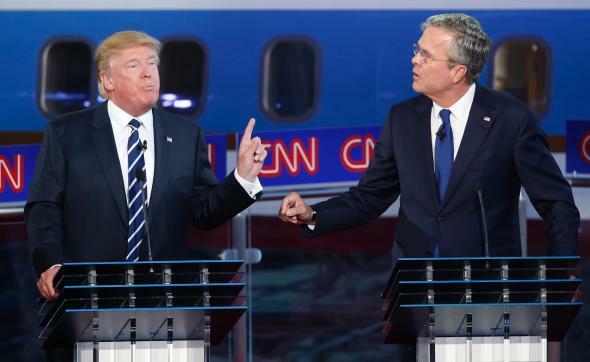 Donald Trump and Jeb Bush at the Republican presidential debate in Simi Valley, California. Conservative radio host Hugh Hewitt asked Jeb Bush a question at Wednesday night’s Republican presidential debate about his brother George W.’s foreign policy advisers. After Bush’s comments, Donald Trump jumped in: “Your brother and your brother’s administration gave us Barack Obama because it was such a disaster those last three months that Abraham Lincoln couldn’t have been elected,” he said. You know what? As it relates to my brother, there is one thing I know for sure, he kept us safe. I don’t know if you remember, Donald. You remember the rubble? You remember the firefighter with his arms around him? He sent a clear signal that the United States would be strong and fight Islamic terrorism and he did keep us safe. The remark got big applause from the audience at the Reagan Library, and even most liberal critics don’t think George W. Bush should or could have prevented 9/11. And yet: Citing the deadliest attack on U.S. soil in history as evidence that someone protected Americans from being killed doesn’t literally make sense. This post has been updated to correct an error in the rush transcript of Bush’s remarks.